Collinsville fans joined Oologah in wearing orange to show support for Oologah student Josh Payton (#1) who is battling cancer. Seth Boomer (#12) had his choice of Walker Roberts (#23) or Hayden West (#33) on this first quarter pass. Seth Boomer (#12) completed a 4 yard TD pass to Levi Draper (#10 below) for the Cardinal's first score of the game to tie the score at 7-7 with 3:03 left in the first quarter. Collinsville entered halftime with renewed hope when Seth Boomer and Hayden West (#33) connected on a 58 yard screen pass play that resulted in the Cards 2nd touchdown with about 41 seconds left in the 2nd quarter. Seth Weiser kicked both of the Collinsville extra points and the half time score was 14-22. Logan Sieminskie (#20) with a downfield block by Carson Cole (#60) had a nice 1st quarter gain. 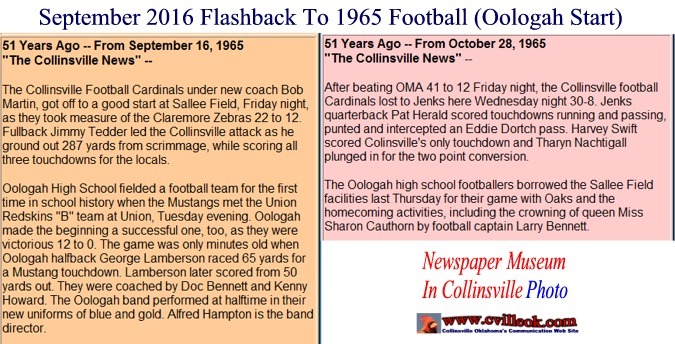 Collinsville recovered an Oologah fumble at the Mustang 44 yard line with 5:05 left in the first quarter ... setting up Collinsville's first scoring drive (ending with Draper's TD catch at 3:03 1Q). Oologah scored on this 62 yard TD pass at 9:41 in the 2nd quarter to retake the lead at 7-14. Their first score was on a 35 yard pass at 9:58 in the 1st quarter. Later Collinsville gave up a safety (snap over the punter's head) with 2:24 left in the half. 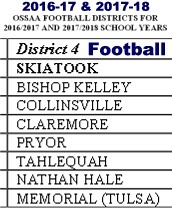 Oologah scored on a short QB keeper at the 1:19 mark of the 2nd quarter to take a 7-22 lead. 2nd quarter action (L-R): Bradley Smith (#73), Logan Sieminskie (#20), Carson Cole (#60 the center), Seth Boomer (#12), and Eli Emmitt (#54). Bradley Smith (#73), and Nate Schaffner (#58) provide protection on this Seth Boomer (#12) second quarter pass play. The Collinsville Crimson Cadet Band performed at halftime. Carson Stout (#2) had a fumble recovery at the 11 yard line with 3:02 left in the game. 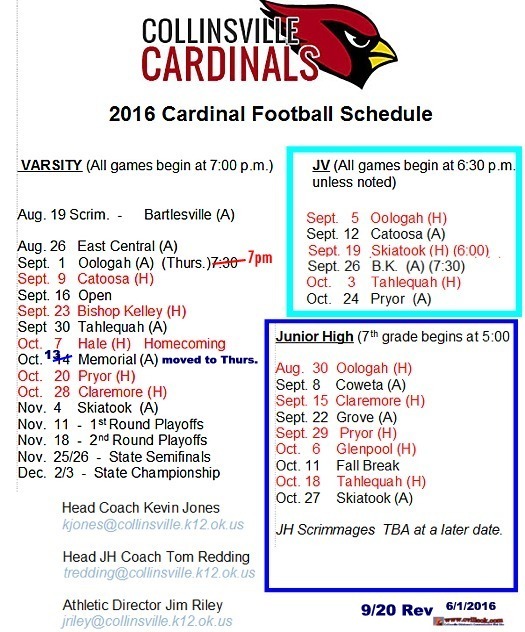 Collinsville Football tweeted: that today's 2016 Oologah-Collinsville football game was the 43rd straight .. with the series starting in 1974. Due to construction on our main cafeteria the visitors gate will now be located on the north side of the stadium just south of the tennis courts. Parking for visitors will be in the North parking lot of the high school, the Vo Ag parking lot and in parking spaces in front of the high school. Visitors may enter from the home side but will have to walk around to the visitors side. Team buses and vans will still park behind the east side of the stadium as normal. Handicap patrons will also be allowed to park behind the east side of the stadium. They must have a handicap tag to be admitted. Please pass along to your fans and staff.